﻿ Nelson-Kennedy Ledges State Park - Ohio. Find It Here. Although a small park, 167-acre Nelson-Kennedy Ledges provides a thrilling experience to visitors with its rugged cliffs and diverse plant life typical of a more northern climate. A day-use park, Nelson-Kennedy Ledges is popular for picnicking and hiking.The spectacular rock formations at Nelson-Kennedy Ledges have become trademarks of the park. 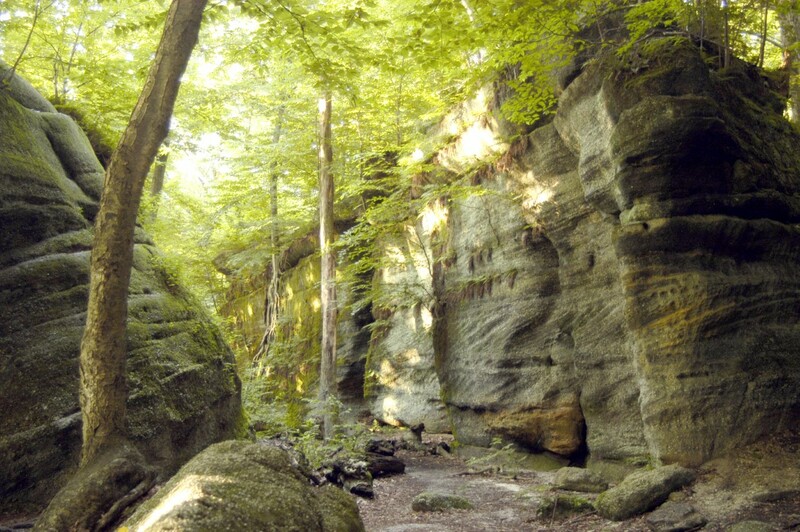 These rock formations are among the few outcrops in northern Ohio still exposed to view. Most of the outcrops elsewhere have been covered with soil and rock left by receding glaciers.The remarkable sandstone cliff formations resulted from the forces of erosion--wind, water freezing and thawing--that wore away at the softer rock layers. As these soft layers eroded, large blocks of rock called slump blocks fell away leaving more resistant layers to form ledges above.